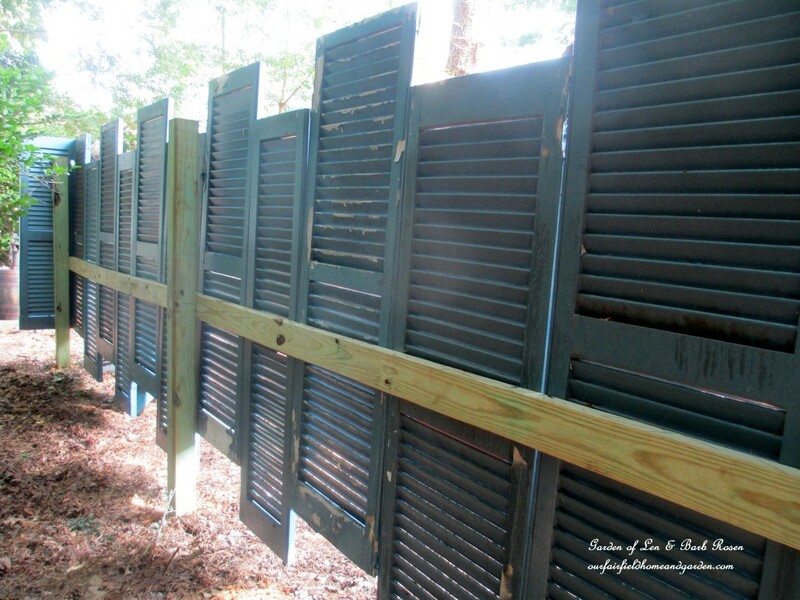 Home » DIY home and garden craft projects » Salvaged ~ Build A Fence From Shutters! 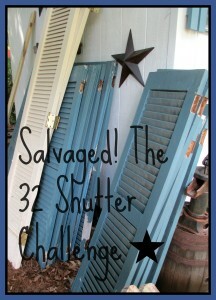 Salvaged ~ Build A Fence From Shutters! 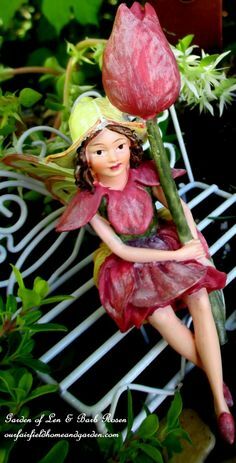 Salvaged! The 32 Shutter Challenge ~ click here to see the rest! 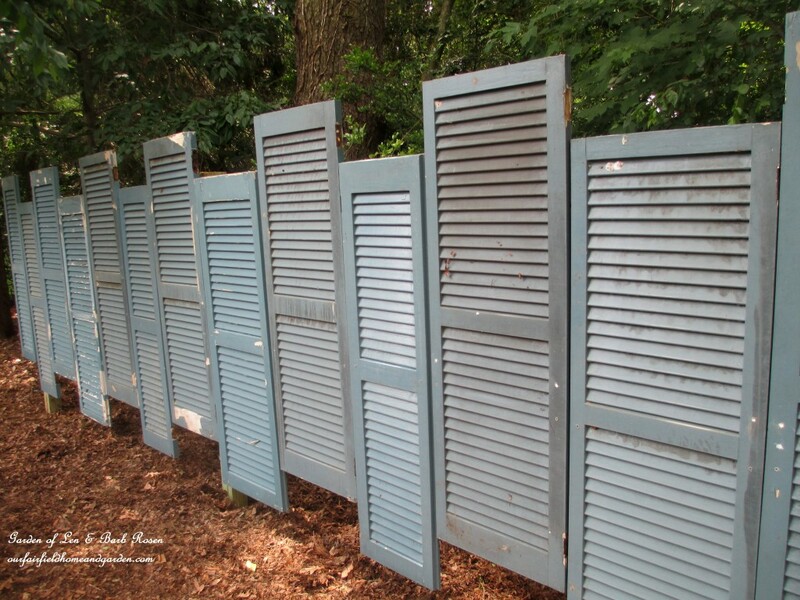 What do you do with thirty-two salvaged shutters? Well, one of the projects I did with fourteen of them was building a fence/screen to define a new garden area in our yard. 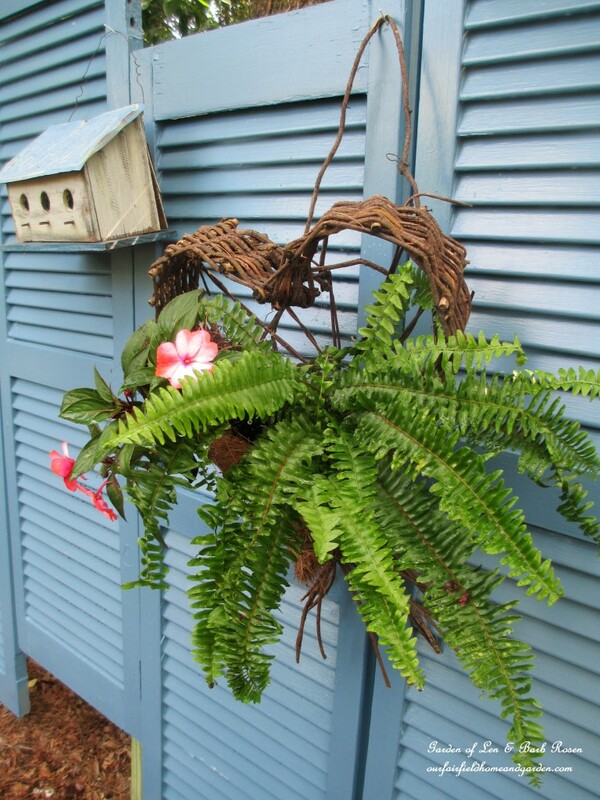 The shutters were salvaged from a friend’s home that had just been painted. They decided to go for a more modern look sans shutters and offered them to me, a win-win! Two different sizes to work with, I had to create a pattern for the fence. 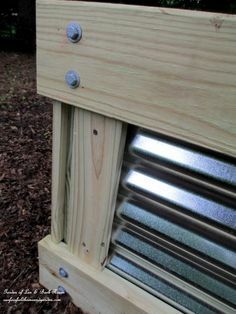 So, we put up three of the larger shutters, then a smaller one all the way across. 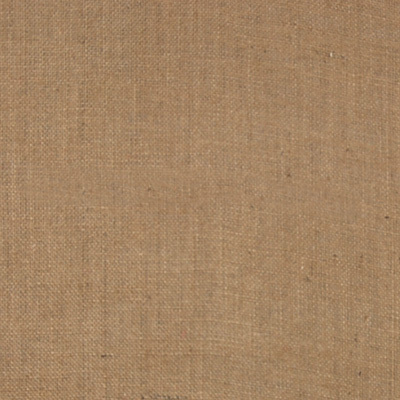 I thought it would be more interesting to have them zig-zagged instead of straight across. A measuring tape and level helped keep us on track. 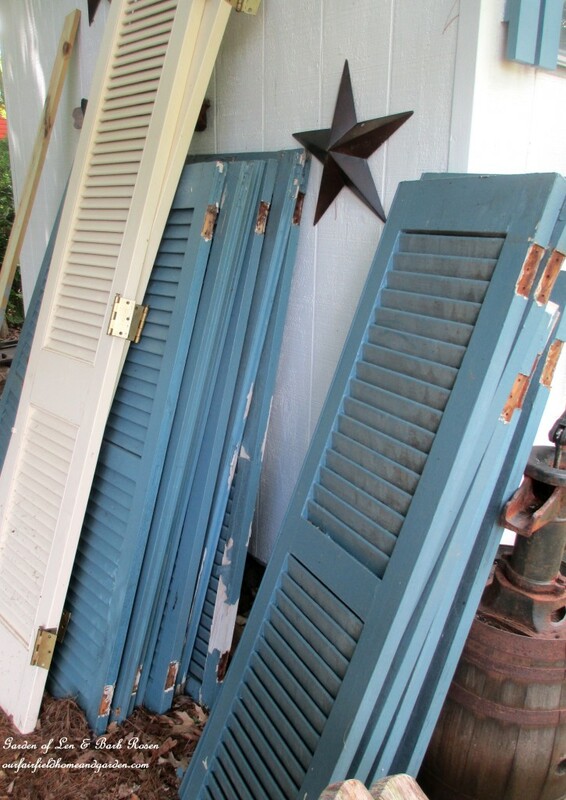 The mother lode of salvaged shutters! We dug holes for three posts and mixed concrete right in around them. 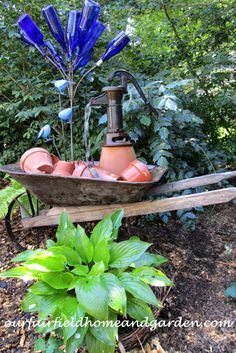 They sat over night for the concrete to harden. The next day, we attached lumber to act as mounting boards for the shutters. Here’s the back of the fence so you can see how it was built! The fence is up! But, not so fast! After the shutter fence was attached , I realized that it was going to need a bit more TLC in the way of cleaning and repainting. Once the fence was up, I still needed to scrub it down and repaint it! 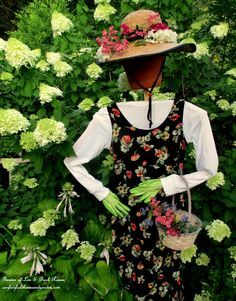 Finally, the fun part of the fence project, dressing it up! 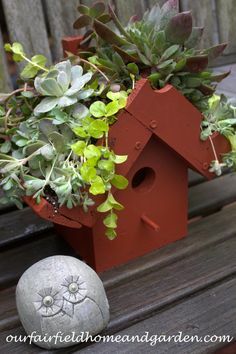 I put two of my birdhouse ladders in front on one side, a planted basket and birdhouse in the middle and our garden lady on the other side. 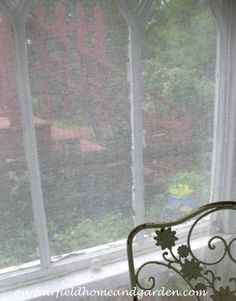 A pretty screen from the neighbor’s backyard, this fence defines the garden space as well. 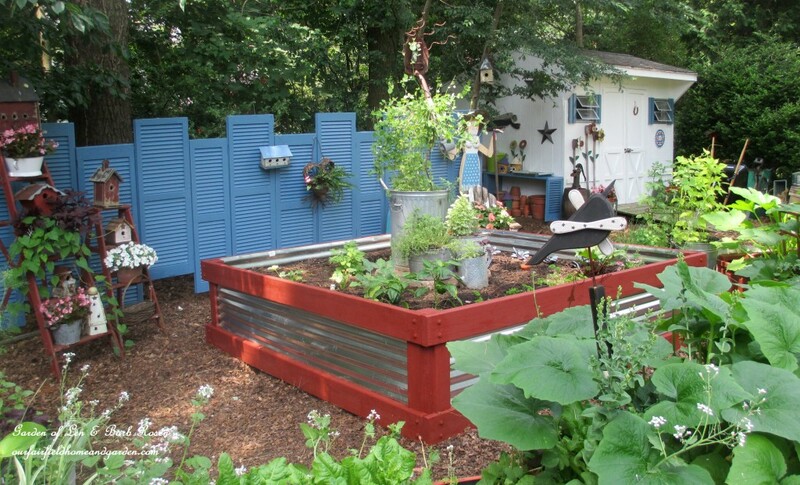 And, there are just enough shutters left to do the same fence on our side yard! The shutter fence serves as a pretty backdrop and screen.